Being an environmentalist, this was something I heard all the time at events like this. My main issue with this statement is the assumption from the individual that environmental sustainability is everyone’s main priority. The reason they (i.e. the politicians) were not doing anything about ‘it’ was the simple fact that everybody wasn’t talking about this issue (i.e. the environment). The environmentalist can be quick to judge those not fully behind the cause as selfish, but humans are more complicated than that, with a lack of appreciation that the average man on the street has other conflicting interests and priorities such as work, health, and their families. Instead of sharing this opinion with the gentleman, I settled for a little smug smile. It was through hearing this statement for what seemed like the 100th time the realisation that we as people are guilty of living in their own bubble, living in networks and communities where the same values and beliefs are shared and debate is kept to a minimum so that views are never challenged, changed or influenced. Through my time working for environmental groups and working in this industry I realised failure to understand people out of the activist bubble resulted in apathy – the environment is a touchy subject as it confronts and challenges the worldview of others and that lack of appreciation can make addressing the subject problematic without coming off preachy. It’s not just environmental groups that live in bubbles, on social networks someone can easily be ‘defriended’ or blocked if it challenges the individuals own discourse. The Internet once thought to break down barriers has created its own form of tribalism. I have used an example of this on a political issue, but it stretches into other areas of life, my first attention towards these bubbles was in the social life of university, where students stayed within the limits of campus and student housing areas, mixing only with students and engaging in student jobs, clubs, groups, and nightlife. Staying within the bubble is a safety net for students, but also generally results in being disliked by the locals. Recognise my preset assumption on a topic, but keep my mind open ready to be influenced. Put my personal opinions, ready prepared questions away and really listen to what the person says and respond as the conversation flows. Never completely dismiss opportunities because it conflicts with my views or ambitions. Use appropriate negotiation/discussion techniques to disagree with opinions rather than rely on unproductive labels that do nothing but shut down conversation and alienate. 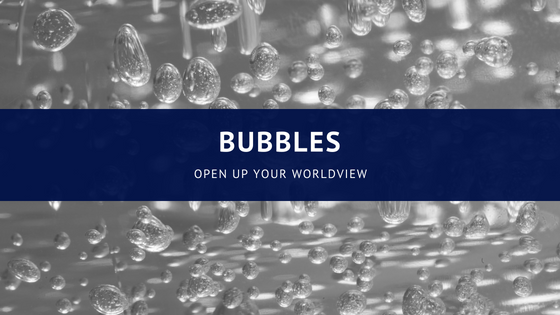 It is really hard to go into a conversation without bringing forward your preset values and beliefs, the trouble is – everyone uses their view of the world to explain a lot of problems. By continuing to live in the bubble we are at risk of continuing to increase safe spaces, filled with weak minded who can’t think out of established thought or debate when someone has a differing view and this isn’t the way to go forward with problem solving. The most interesting point in this post is that activists are finally starting to figure this out. Those of us outside the bubble(s) have been warning about this very thing for decades. Just wait till it gets out that the anti-fracking campaign is really a product of Russian collusion with American environmental groups for the lone purpose of getting a better price for Russian natural gas.